"I recommend it to those seeking a career in broadcasting"
"I’ve been using Creating Powerful Radio for several years in my programming class, and have moved up to your new release. I’m using these textbooks in my course COMM375 Programming/Advanced Announcing. My required texts are Beyond Powerful Radio, and I’m also requiring the Powerful Radio Workbook. "I'm adding your book for use this Fall in our Announcing class and in another class. I just downloaded the instructor's manual!" Fullerton College, Orange Co. Calif.
"Never has the medium needed someone with [Valerie Geller's] vision and knowledge more. In this new and vastly enhanced edition of Creating Powerful Radio, the reader will find a comprehensive and incisive schematic for achieving success in every aspect of station operations. Valerie Geller provides professionals and students alike with an invaluable resource. - Michael C. Keith Ph.D.
"I wish I could have read this book on day one! Thankfully my students can. [Valerie Geller offers] an unparalleled understanding of what makes great talk radio - and communicates it in a way that's refreshingly simple." career in radio should read this!" Career Strategist, Author: "Skills for Success"
"I have used Valerie Geller’s Powerful Radio Workbook for ten semesters in our Radio Practicum course. The new Creating Powerful Radio covers all areas of radio announcing and takes her previous book to another level of excellence for training future radio broadcasters. Our current radio students can’t wait to use the new book next semester. - Linwood A. Hagin, Ph.D.
"This is one students will want to keep after the class is over! 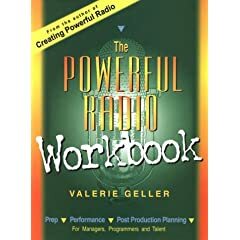 I not only recommend Creating Powerful Radio as a text, I believe in this book so much, I built my curriculum around it AND wrote the Instructor Manual." "Creating Powerful Radio is great. It's the required textbook for RTV436JA - News Announcing II." "I'm thrilled with this book. We use Creating Powerful Radio as a text for our first and second year students and for our news classes. 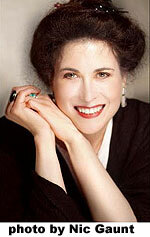 "Valerie Geller has a gift for breaking down the basics of broadcasting. This book explains important techniques for helping the beginner all the way up to the most seasoned pro. It is a way to think about radio as a larger medium, how to use the airways as a canvas, as an art. I highly recommend this and all of Valerie's books to anyone interested in radio broadcasting. These books should be in all broadcast schools and radio stations, no matter how large the radio station is. We all need reminding of how to create powerful radio." "A couple of my best students took a glance through it and asked "What class will we get to use this book in? Creating Powerful Radio will definitely be in my Fall line-up!" RTNDA COMMUNICATOR -CREATING POWERFUL RADIO EXCERPT - Overcome the blah, blah, blah: Soulutions for the dull news day..."
"I've been reviewing your textbook (Creating Powerful Radio) and you have hit a grandslam. I'm developing a radio program at a community college & your book is by far the best. For several semesters I didn't use a textbook while working at a state university because all the books I examined where irrelevant, largely because they lacked a perspective from a professional, major-market talent who has worked in the trenches. This book is one that my students must purchase. Thanks for putting your wisdom into a textbook! " "Creating Powerful Radio" has become a required textbook as part of the curriculum for Hudson Valley Community College's broadcast radio course." "I’m using Creating Powerful Radio in my intro to Broadcasting class." "I will be using "...Powerful Radio" as the text in an introductory radio production course in the Department of Communication and Journalism at the University of St. Thomas in St. Paul, MN. My students (sophomores) will be producing a half-hour news and information program weekly once we get to the fourth week of classes. I think the book is going to be a useful guide for them." "Manchester Community College will be adopting Creating Powerful Radio for my Broadcast Performance class starting this Fall 08!" "This publication provides a wealth of material that would make it good reading for a broadcast performance or radio production course and contains valuable lessons for aspiring radio talent in college and university broadcast programs around the globe. It is easy to read and digest. This book also deserves a place on the office bookshelves of radio station program directors." "I'm submitting this book to my chair! One more for Creating Powerful Radio!" "I teach broadcasting classes and am trying to get a radio talk show class off the ground next summer. I've just submitted Creating Powerful Radio to my chair. I want the book. It's the only book I, or any of my colleagues have found that deals specifically with what we are looking for." "I tell everyone who approaches me for a job...I won't even consider them for an opening unless they can be ready to recite chapter and verse of "Creating Powerful Radio" and know stuff from the "Powerful Radio Workbook." 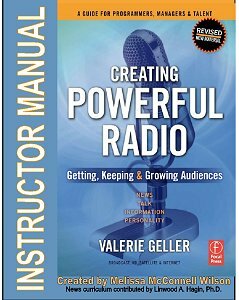 "The instructor’s manual for Creating Powerful Radio is fantastic. The course I teach at Briarwood is called “Newscasting & Announcing.” We’re swinging this course in a more practical direction, and that’s why your book (and it’s amazingly equally powerful instructor’s guide) became my choice. [In this class] they’ll be writing, but my thing is to teach them the theory and zen behind what makes powerful radio… more engaging, motivational and inspirational to some guy or girl who’s simply hot to get their first gig at a station. So thanks again for the instructor’s manual! I’ve only begun to pour thru the 100+ pages, and everything I’ve seen so far rocks big time! Most textbooks don't go this far! I had no idea you’d go into this much elaborate detail in structuring the materials, classroom exercises and discussion topics for the teacher. Very, very, very nice. Thanks! I already appreciate it." "Packed with insights, well written, and fun to read. It's obvious why so many radio people consider this book 'a must!' "
"I recommend it to everyone and I use it in my classes. "Creating Powerful Radio has been valuable for use in Introduction to Radio and Media classes and I recommend it for any class with Production elements. "Creating Powerful Radio might eventually make an executive's job at a satellite formatted affiliate much tougher." "I will be using this book in my summer classes and recommending that my colleagues do the same when they teach the course." - Andrew M. Clark, Ph. D.
READ THE REVIEW IN THE JOURNAL OF RADIO & AUDIO MEDIA- MAY 2008! "We are submitting this book for adoption in my MC342 Radio Programming Strategies course." 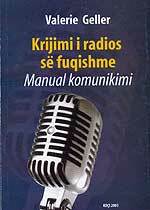 "I wish I had this book when I started as a broadcaster. It should be on every teacher's booklist!" "Fun to read. 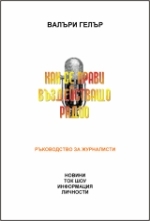 I wish I had this book when I was a new radio programmer…it would have come in handy!" - Brenda K. Jaskulske, M.A. cover in Comm 424 Radio Programming." "I'm an adjunct professor at Nyack Christian College, using your latest book as the text. I could not think of a better source of knowledge for these up and coming broadcasters." * Are you using "Creating Powerful Radio" as a text for your broadcast course? the University of Nebraska at Kearney. I teach the JMC 336 course each semester, which is a workshop from which I draw staff for the station. Geller Media International president, broadcast consultant, and talent trainer, Valerie Geller just signed a new book deal with Focal Press for "BEYOND POWERFUL RADIO - A COMMUNICATOR'S HANDBOOK FOR THE INTERNET AGE" slated for publication in the spring of 2011. 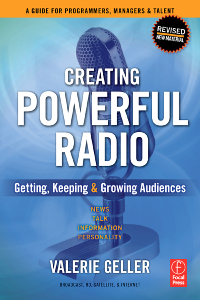 This will be Geller's fourth book, her third, "Creating Powerful Radio - Getting, Keeping & Growing Audiences" is now in a third printing from Focal Press. Geller Awarded. Geller Media International President, Consultant and Creating Powerful Radio author Valerie Geller accepting the Conclave's highest honor, the"Rockwell Lifetime Achievement Award" presented by Edison Research & www.radio-info.com Editor Sean Ross in Minneapolis July 16, 2010.